If you want to make a clay animal figure, what pops into your mind? Clay (of course!)? The sculpturing plan? And getting your hands dirty to transform the clay! 3D printing is similar to clay sculpting. If you want to make a model, you also need the material, the sculpturing plan (in terms of computer programming language) and a 3D printer to form the intriguing structures. In fact, 3D printing has seen a boom in recent years, with sculptures ranging from kitchen utensils, to houses and even body organs substitutes! The 3D printing method has eliminated the need to use molds for production lines in the manufacturing industry and has become a prominent fast and efficient production method. In principle, 3D printing works by depositing material layer-by-layer controlled by a computer design program (Figure 1). This additive process is similar to making polymers, where molecules (named as monomers or oligomers) are added one by one to form a chain of molecules (polymer). In particular, some chemists have looked into how light can trigger monomers to build polymers (polymerization) with 3D printing. It is like stacking lego bricks to build a tower, but instead of using your hands, chemists use light! And since these polymers are built by light, they are called photopolymers. To make 3D printed photopolymers, we need molecules that can absorb light (photoinitiator), and the “lego blocks”: monomers or oligomers. The photoinitiators act as fuel to build polymers, while the monomers or oligomers are the fundamentals that determine the physical and chemical properties of the final product. An example of the 3D printing system for photopolymerisation is called Continuous Liquid Interface Production (CLIP). Imagine a basin with liquid monomers. A light source is shone through a transparent window beneath the basin and causes the monomers to join together and solidify. The structure gradually rises due to new layers formed from the bottom of the basin. A membrane lies below the basin allows oxygen to pass through. This quenches the reaction between monomers and the basin, therefore preventing the product from sticking onto the basin (Figure 2). Figure 2. Schematic diagram of CLIP system. 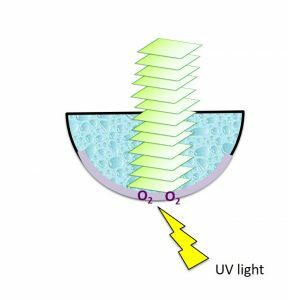 The UV light triggers liquid monomers to form solid polymer from the bottom of the basin. The membrane allows oxygen to pass through preventing polymer from sticking to the basin. 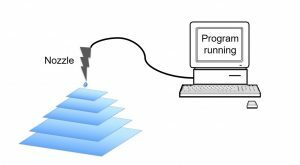 While some research dedicated to 3D printing systems has been done, the success of 3D printing photopolymers also depends on the quality and efficiency of the photoinitiators and monomers used. 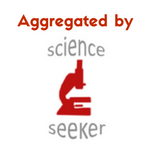 Some scientists have focused on searching out suitable photoinitiators for medical use. As our body consists mainly of water and delicate cells, research has focused on materials that can dissolve in water and is non-toxic to cells. This flourishes the research in hydrogels as photoinitiators. One of the common examples is the compound, 2-Hydroxy-1-[4-(2-hydroxyethoxy) phenyl]-2-methyl-1-propanone (Figure 3a). It is not harmful to cells and has been widely used in biomaterials. However, it can only absorb UV light, and UV light can damage living cells. This leads to the search for photoinitiators that are sensitive to visible light. Recently, scientists have reported the combination use of Sudan II and Ivocerin (Figure 3b) to trigger polymerization of thiol/alkyne carbonate based monomers with blue light. As building blocks, monomers and oligomers influence the properties of the final product. The compounds, (meth)acrylates, have been widely studied as they can form polymers quickly and exhibit both solution and gelation forms (sol-gel properties). However unlike lego bricks that can stack only in one direction as a chain, (methy) acrylates can also form bonds between chains. This limits the flexibility of the final product, causing it to break easily. Recently, scientists have reported several alkyne carbonate based compounds that also have lower toxicity to cells, faster conversion rates, and are less easy to break compared to acrylates. They are promising materials for building bone tissues. Other alternatives to acrylates including siloxanes and silicon rubber have also been explored due to their flexibility. 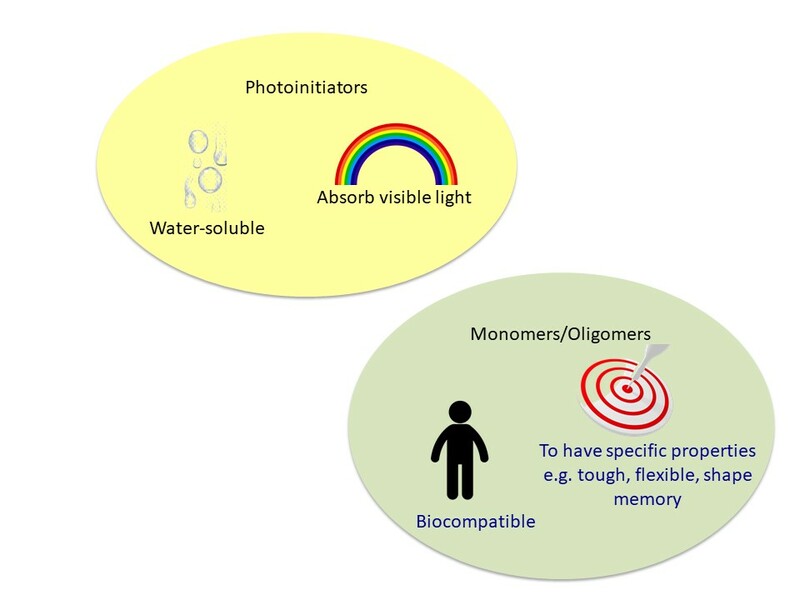 The field of 3D printing of photopolymers has been emerging and scientists have been continuing to crave for new photoinitiators and monomers for specific features and applications (Figure 4). 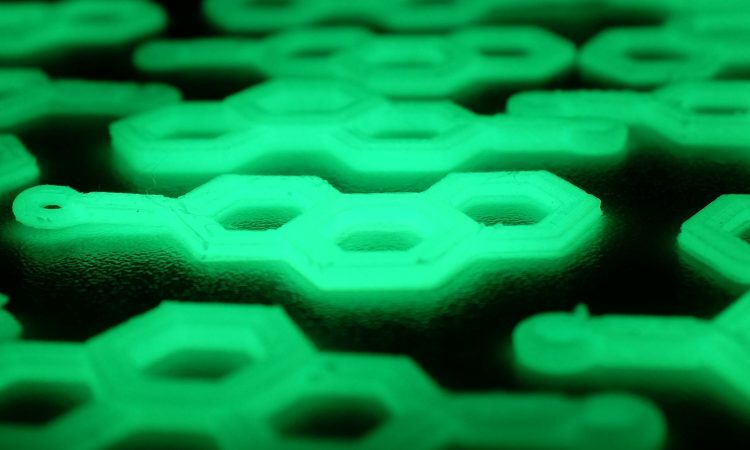 The material world could be entering into a new era with novel photopolymers in future!